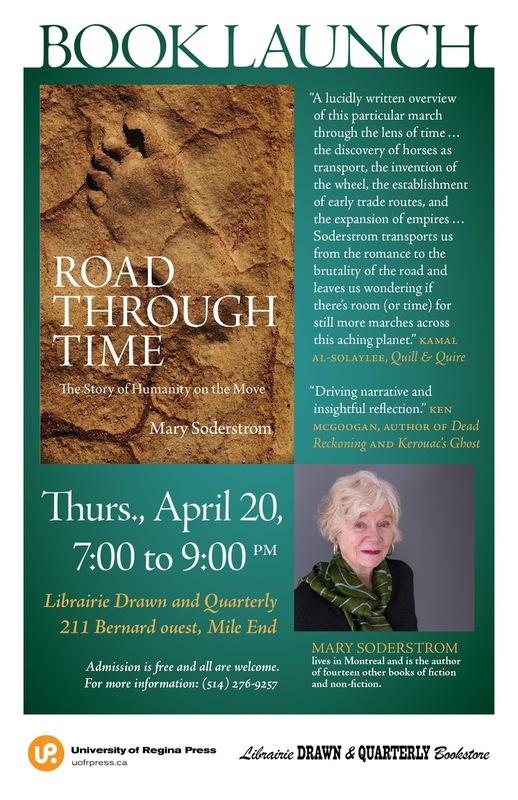 Join us for the launch of Mary Soderstrom's latest book: Road through Time: The Story of Humanity on the Move (University of Regina Press, Spring 2017) on Thursday, April 20th at 7:00 pm. Accessible and entertaining, Road Through Time begins with the story of how anatomically modern humans left Africa to populate the world. She then carries us along the Silk Road in Central Asia, and tells of roads built for war in Persia, the Andes, and the Roman Empire. She sails across the seas, and introduces the first railways, all before plunking us down in the middle of a massive, modern freeway. The book closes with a view from the end of the road, literally and figuratively, asking, can we meet the challenges presented by a mode of travel dependent on hydrocarbons, or will we decline, like so many civilizations that have come before us?